The Social Model of Disability has been adopted by MDPAG and many other disabled people’s organisations and public sector organisations and explains how different barriers are what disable people. It recognises that it is the removal of barriers that support inclusion. 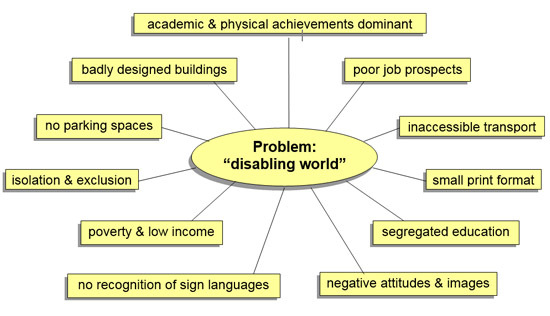 This is an alternative way of understanding access issues and social exclusion and sees the problem as a “disabling world”. All the following issues are examples of situations which can be changed and allow disabled people to participate in mainstream society. Some of these issues can be resolved by consulting with disabled people, changing attitudes, policies and practices, rethinking budget priorities and expenditure, challenging barriers and exploring why our society doesn’t treat all its members as equal. Other issues may need radical political decisions. Acknowledgements: This version of the social model of disability has been adapted from models developed by Unison NW and Pam Thomas.